Every year, the folks at EA Sports rig a game of Madden to predict the Super Bowl. They're usually right—they've nailed something like eight of the last 11 winners. This time, it's safe to say that EA just rigged the actual Super Bowl. 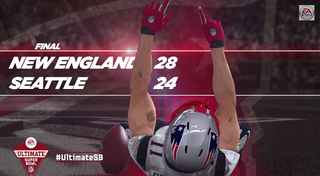 As Madden 15 predicted, the Patriots beat the Seahawks 28-24. They called that the Patriots would come back from behind after being down 14-24, too. They didn't get the game-winning Russell Wilson pick, but still. Hope someone at EA Sports put down some good money.